Interested in LASIK Surgery in Fayetteville, NC? LASIK is currently the most popular refractive surgery available. In fact, statistics claim that over one million LASIK procedures are performed annually in the United States! If you are one of the many people considering LASIK for vision correction, our eye doctors at Risk Optometric Associates, PA, will meet with you to determine your candidacy. When it comes to LASIK and all refractive surgeries, we are highly experienced at managing all pre-operative and post-operative care. We’ll also help match you with the best surgeon for your visual condition and ocular needs. Call to schedule an appointment in one of our offices located in Central North Carolina. Short for “laser-assisted in situ keratomileusis”, this vision correction procedure uses a laser to reshape your cornea so that it focuses light into your eye and onto your retina more effectively. Whether you need to correct nearsightedness or farsightedness, LASIK will fix your condition and create sharp, clear vision. It can also be used to successfully resolve astigmatism. For more information about LASIK and how it can help you, schedule an appointment in one of our Risk Optometric Associates, PA, offices in Fayetteville, Jacksonville, Fort Brag, Aberdeen, Hope Mills, Raeford or Hendersonville, NC. In general, if you are over 18 years old, have sufficient corneal thickness, stable vision and healthy eyes, you will be a good candidate for LASIK. Your vision prescription must also be within certain limits. If you are interested in LASIK, our eye doctors look forward to meeting with you at a Risk Optometric Associates, PA office in Central North Carolina, to evaluate your eye health and vision condition. Specific eye problems, such as Dry Eye Syndrome and other corneal diseases or abnormalities, may disqualify you from undergoing this refractive laser procedure. Other general health conditions may also make you a poor candidate. Only a comprehensive eye examination can determine your candidacy with accuracy. Call today to book your pre-op exam with one of our expert optometrists! 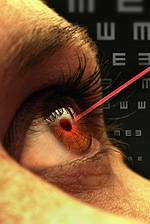 Take comfort in the fact that extreme complications from LASIK are extremely rare. Significant or permanent vision loss is almost unheard of, and many other possible complications can be corrected effectively by re-treatment with laser. Dry eyes are also commonly reported within the first half-year after LASIK. Medical treatment, such as prescription eye drops and artificial tears, generally resolves this complaint. An under-correction or over-correction of your vision condition may cause a slight blurring of your eyesight, which can usually be fixed with another LASIK procedure to enhance the results. Although rare, eye infections, irritations or inflammation may also be experienced. In these cases, medications with antibiotics or steroids will often be prescribed to alleviate symptoms.